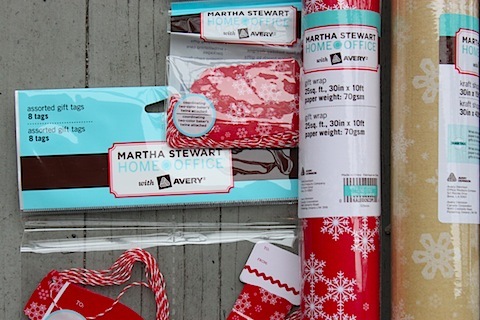 For the past couple of years I just purchased my holiday wrap and supplies at work since Paper Source is known for this type of thing, but this year when our new friends at Avery asked if we’d like to review Martha Stewart’s line of holiday product, I jumped on the opportunity. First, because it’s sold at Staples and as you already know, I have the hugest crush on that store. 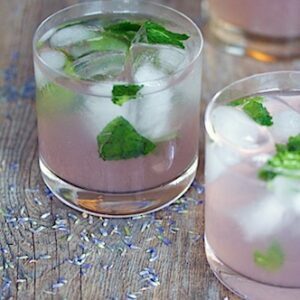 And second, I love experimenting with different brands to see how they work! 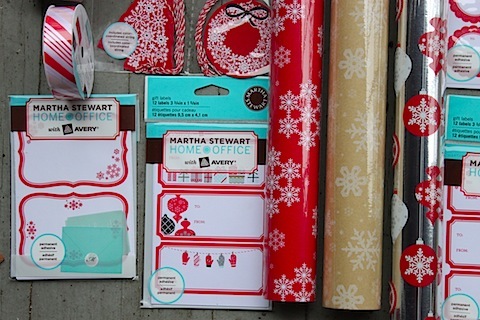 All of the product was, of course, very Martha and festive, using golds, reds, and silvers as well as simple and clean lines and seasonal motifs like mittens, snowflakes, and ornaments. I was especially digging the little mitten and stocking gift tags with red and white baker’s twine! 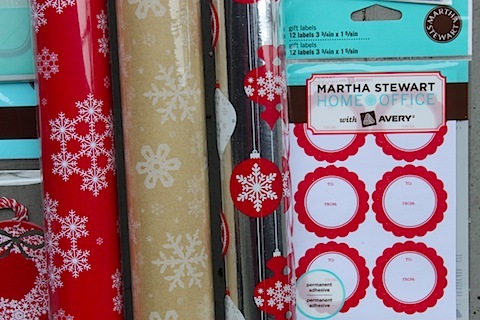 And the silver foil stickers are adorable and would be great for adorning packages or even holiday greeting cards. 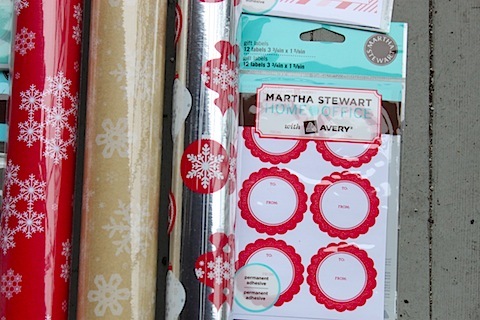 As I was wrapping some gifts and going through the products, I realized that a lot of the labels, like the red scalloped ones, are great year-round embellishments, which I loved! Whenever I wrap a gift for someone while I’m working at Paper Source, they’re always amazed by how “professional” it looks. 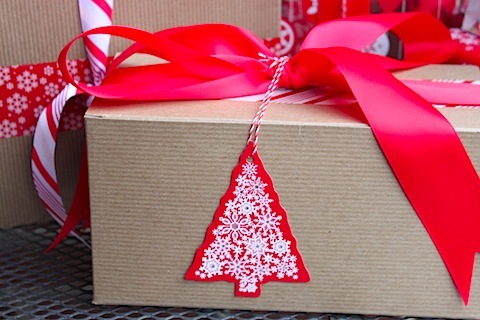 So, here’s a little fun fact that I’d like to share about gift wrapping. 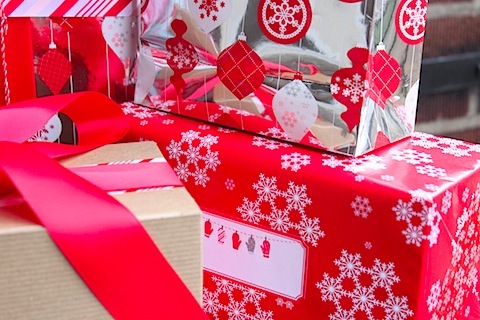 If you want your gifts to look nice and neat, always use double sided tape. My personal preference is Scotch’s Permanent Double-Side tape. It’s never done me wrong and sticks really well to most paper. The Avery with Martha Stewart wrap folded and creased wonderfully (I love a crisp edge on a gift!) and was sturdy enough to be able to comfortably correct any mistakes in folds or taping without tearing the paper. This was definitely not that kind of wrapping paper that was really thin and tore if you even looked at it. It holds up nicely! 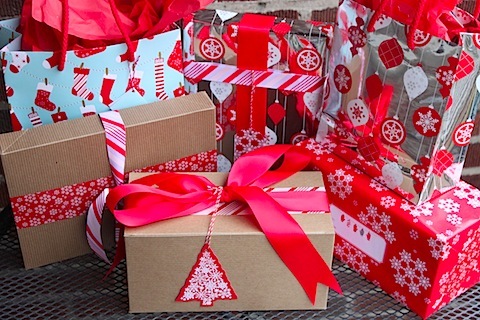 I’ve only wrapped a handful of gifts so far and I’m excited to tackle the rest of them this week. Although, who am I kidding, I was loving the gift bags I was sent the most because all I needed to do was add some festive tissue paper and call it a day 😉 I might need to head to Staples to buy some more of the bags, haha. 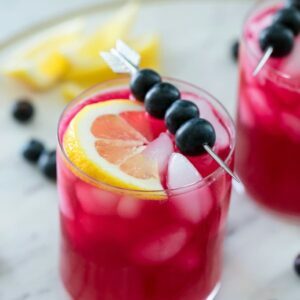 Thank you to the lovely people at Avery for extending a 40% off coupon to We are not Martha readers! 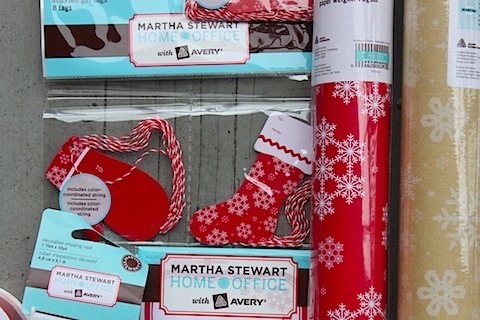 You can use the coupon at any Staples for any one Martha Stewart Home Office with Avery purchase. It expires 12/31/12 and can be used on any product in the collection. That means datebooks, calendars, holiday wrap, tags, etc.! 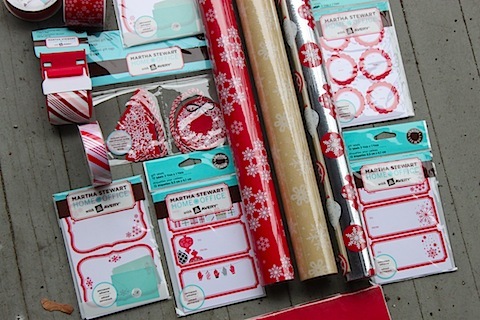 What’s your favorite method to wrapping holiday gifts? 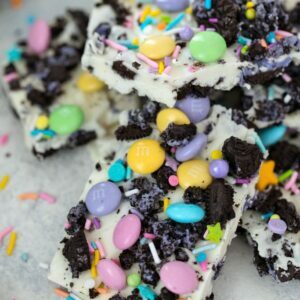 Do you stick with a specific color scheme each year? In the wake of such a heart-wrenching tragedy in Connecticut, it’s difficult to write about this time of year and gifts and happiness and joy without acknowledging the people who were lost on Friday. The people who were put through a pure nightmare. I spent this weekend at holiday events surrounded by some of the most loving and loveliest people I’ve ever known. 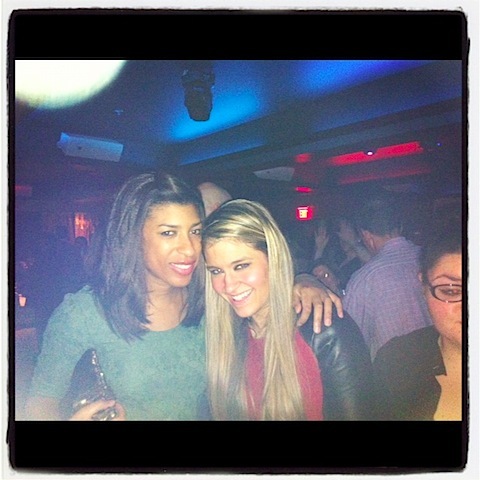 I’m blessed enough to be able to smile with people I adore. 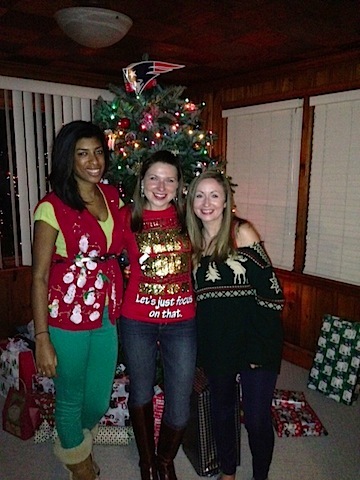 This weekend we celebrated what’s supposed to be the most wonderful time of the year. Over the course of the weekend I’d stop and think that just a couple states away, so many were struggling over something that should just never happen. Something that should never even be imagined. 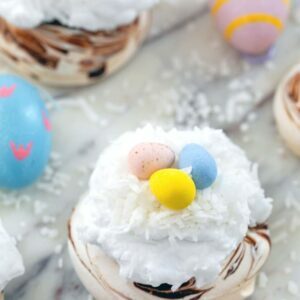 I try not to push my beliefs too hard, especially on this happy blog, but all I have to say is I can’t wait to be with my whole family next week. To hug them and be cozy with them. To laugh about foolishness and to tease each other like we always do. And as small as this world is, I wish it was smaller so I could hug and be cozy with all of the families and babies who were forever changed by what happened on Friday. I give them all of my prayers. 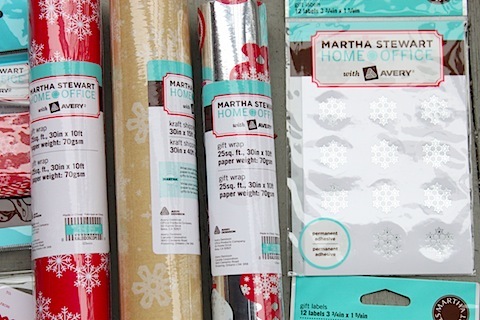 7 Responses to "Martha Stewart with Avery Holiday Product + Staples Coupon"
These look professionally wrapped, Chels. Gorgeous!! oooh I can definitely see why you would do a happy dance! what a fun package to receive! I am pretty high maintenance when it comes to wrapping. 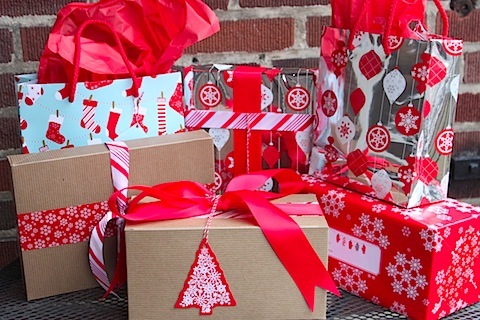 I like for all my gifts to match and I use different ribbons for different family members. So my Dad is green ribbon and my Mom red for example so all their gifts will have the same color ribbon so I can spot under the tree easily. 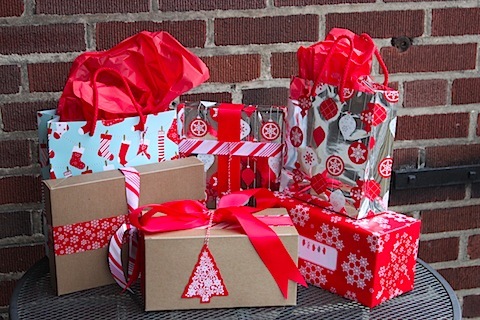 I wish I had bought my holiday wrapping paper at Staples, I love it!! And I’m jealous of your present- wrapping skills, I can’t wrap like that! thank you for that coupon!! 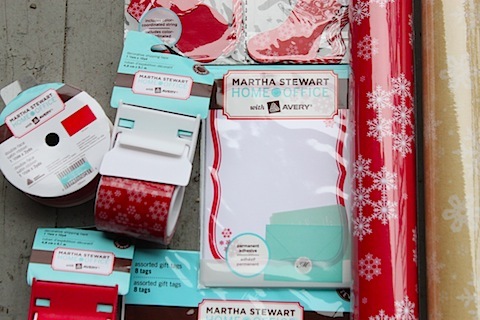 I’ve been obsessed with the martha products ever since Susie first tweeted about the collaboration.